The New Vision Nutrition team has come together to make the first nation-wide diet plan in which the customer is receiving fresh bought and prepared meals that are designed to meet his/her particular goals. New Vision Nutrition contracted with Striking Web Solutions to move their current eCommerce operations from a hosted, small business provider to an enterprise grade platform. Striking Web Solutions worked systematically to build a custom Magento Platform specifically tailored to New Vision Nutrition’s needs. 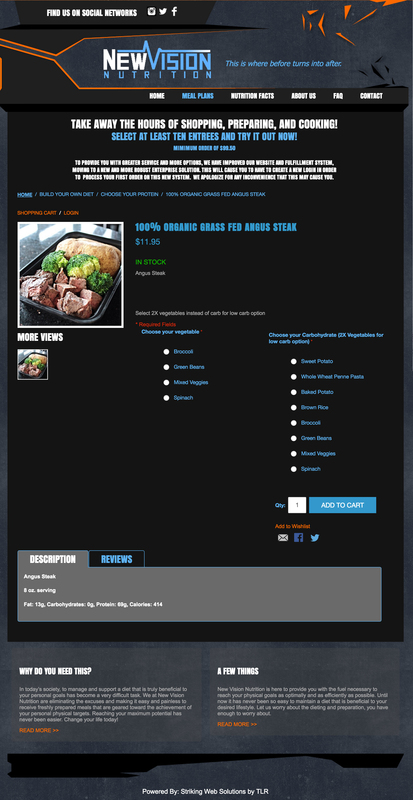 Now that New Vision Nutrition is running on Magento, the possibilities are endless! This is sure to bring New Vision Nutrition lots of success.